Murchison is a rural township and district in northern Victoria. It is on the western side of the Goulburn River and is 30 km south-west of Shepparton. The Waranga Basin reservoir is 12 km west of Murchison. The first European settlers in the Murchison district included William le Souef who took up the supervision of an Aboriginal Protectorate on the Goulburn River in 1840. It was immediately east of the present Murchison township. In 1853 gold was discovered at nearby Rushworth and Whroo. Both places were joined by a track from Bendigo to the Ovens goldfields, and the track crossed the Goulburn River near the Protectorate. In 1854 a site for a town was surveyed next to the former Protectorate, which had closed in 1850. It was named Murchison, probably after a local settler John Murchison, who was related to le Souef. (John Murchison was also a cousin of Sir Roderick Murchison, a famed geologist, after whom several sites and places elsewhere in Australia had been named). A punt across the river was opened in 1854 by one of the purchasers of a town lot. By 1865 Murchison had numerous small and medium farms, as pastoral runs were cut up, and a flour mill at Noorlini, 6 km south of the township, to grind locally grown wheat. (The mill is a registered historic building). In addition there were a school, two hotels and storekeepers. In the 1870s new land legislation caused the subdivision of pastoral runs for farm selections. Between 1871 and 1875 the Waranga shire, in which Murchison was situated, increased its areas under wheat and under fallow two fold and six fold respectively. In Murchison a mechanics’ institute was opened in 1874, and Presbyterian, Anglican and Catholic churches were built during that decade. A railway line was built along the eastern side of the Goulburn River in 1880, passing through Murchison East. Ten years later a branch line crossed the river to the west, passing through Murchison to Colbinabbin. In 1891 the Goulburn Weir was built, feeding water into a serpentine Stuart Murray channel from which irrigation channels were drawn in the direction of Murchison and its hinterland. (Stuart Murray was the local water trust engineer and became the first chair of the State Rivers and Water Supply Commission). The irrigation capacity was increased by the completion of the Waranga Basin reservoir in 1905, which is joined to the Goulburn Weir by the Stuart Murray channel. After the 1890s Murchison entered a period of stagnation. A large estate to the north, Dhurringile, remained in the hands of a wealthy pastoral family, and precluded an influx of population. An unusually acrimonious series of town disputes stopped initiatives for commerce and development. A large influx of population came during World War II when internment and prisoner-of-war camps were established in a lightly inhabited area surrounded by the Waranga basin and the Stuart Murray channel. The Dhurringile homestead was used for German prisoners-of-war. Several thousand people, including families, were held in camps and over 500 remained there when the 1947 census was taken. A cemetery at Murchison which interred the remains of 130 Italian prisoners-of-war and internees became a place of pilgrimage. After the war the Presbyterian Church used it as a training camp for English and Scottish orphans, until the Victorian Government purchased it in 1965 to use as a minimum-security prison. Over the years the grounds have been reduced to just over 100 hectares. Dhurringile prison farm is on the Mutchison-Tatura Road at Murchison. 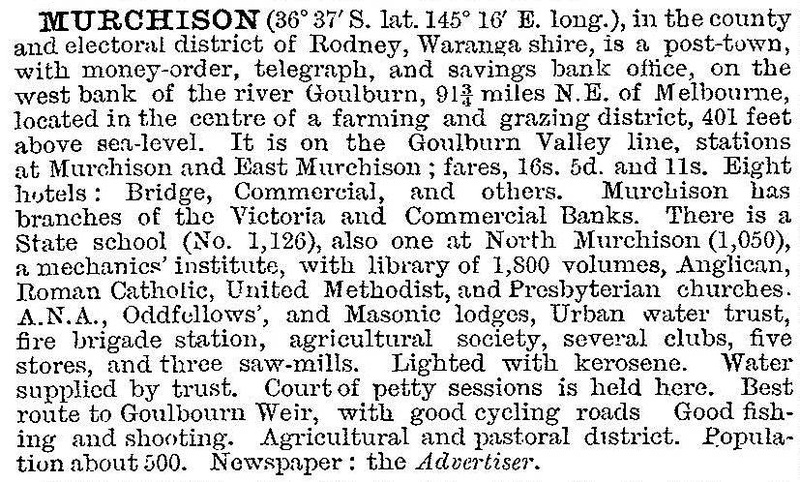 Murchison was a comfortable postwar country town with public gardens, reticulated water and electricity, varied agriculture and sawmilling. There was no other significant industry apart from retailing. The town’s function as a local service centre has remained much the same. In 1969 Murchison was a site of international scientific interest when a meteorite of rare mineral composition showered hundreds of fragments on the area. About one hundred kilograms of fragments have been recovered and have been studied for clues to the origins of the universe and perhaps, very early life. Murchison has a school (115 pupils, 2014), three churches, a hospital, a nursing home, low income housing units, a golf links, ovals, a tennis court, a bowling green, a swimming pool, a public hall and a caravan park. To its east there is a State forest along the Goulburn River, and the river’s Chinaman’s Bend commemorates a Chinese market gardener who supplied Murchison with produce. There are a few historic buildings in Murchison: the Common School (1871) is a rare survivor, but unregistered; and the Bridge Hotel, on a site dating from Murchison’s commercial origins, is on the Victorian Heritage Register.